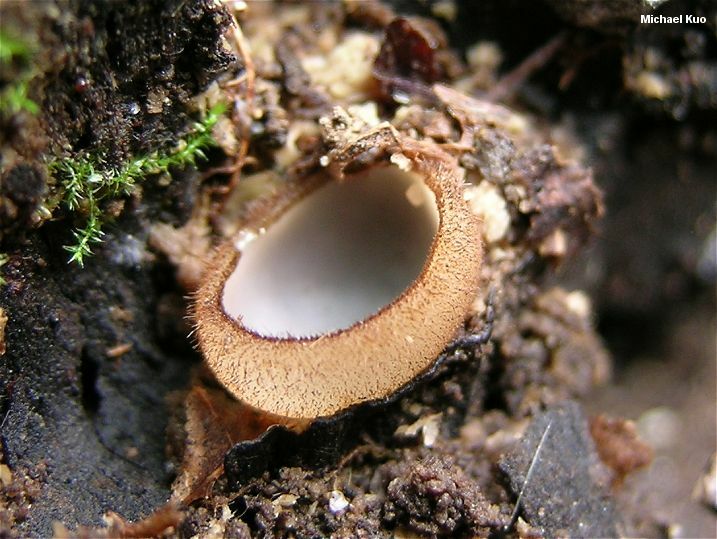 Here is a tiny cup fungus that is fairly easily identified (for a change). Humaria hemisphaerica reaches a width of 2 or 3 cm. It has a whitish or pale bluish upper surface, and a brown outer surface that is entirely covered with stiff, brown hairs. 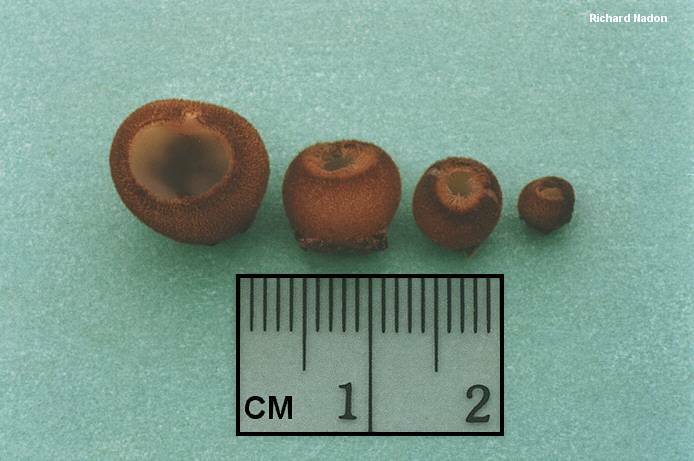 Most other "eyelash cups" are either brightly colored, or are smaller (or appear only in limited areas like burn sites)--but species of Jafnea, in eastern North America, are superficially similar; see the key to cup fungi for help separating these mushrooms. 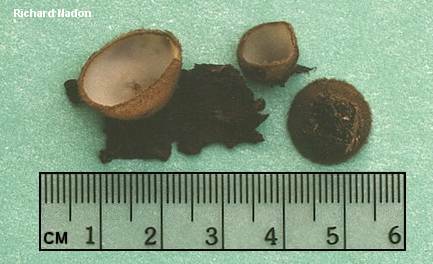 Humaria hemisphaerica is widely distributed, growing on soil and, less frequently, on well rotted wood. 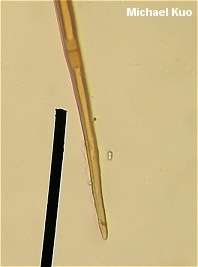 Patella albida and Humaria hemispherica (without the a) are synonyms. Ecology: Mycorrhizal with hardwoods (but sometimes growing on the well-decayed deadwood of hardwoods); growing alone or gregariously; summer and fall; widely distributed in North America. Fruiting Body: Goblet shaped when young, becoming more broadly cup-shaped and reaching widths of 2-3 cm when mature; upper surface white or pale bluish, fairly smooth; undersurface densely hairy with prominent hairs that extend above the margin of the cup, brown; without a stem; odor none; flesh brownish or pale, brittle. 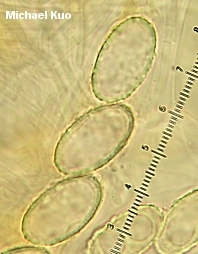 Microscopic Features: Spores 20-24 x 10-12 µ; elliptical, often with somewhat flattened ends; usually with two oil droplets that break up at maturity; smooth in KOH, but warty or roughened-asperulate in Melzer's reagent. Asci eight-spored; tips not bluing in Melzer's reagent. 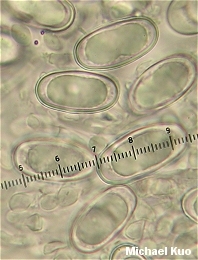 Paraphyses filiform with clavate apices; hyaline in KOH; septate. Hairs brown in KOH; frequently septate; smooth; thick-walled; 7.5-12.5 µ wide; apices sharpened to a point. REFERENCES: (Wiggers, 1780) Fuckel, 1869. (Fries, 1822; Saccardo, 1889; Seaver, 1928; Smith, Smith & Weber, 1981; Breitenbach & Krânzlin, 1984; Arora, 1986; Phillips, 1991/2005; Lincoff, 1992; Barron, 1999; Roody, 2003; McNeil, 2006; Trudell & Ammirati, 2009.) Herb. Kuo 06160303, 10030402, 07230803, 06230904. Kuo, M. (2012, July). Humaria hemisphaerica. Retrieved from the MushroomExpert.Com Web site: http://www.mushroomexpert.com/humaria_hemisphaerica.html.